The pectoral muscles (pecs, referring to Pectoralis major and minor), are located on the chest. Working these muscles is the key purpose of any chest workout, and there is a variety of exercises that all train and strengthen the chest. 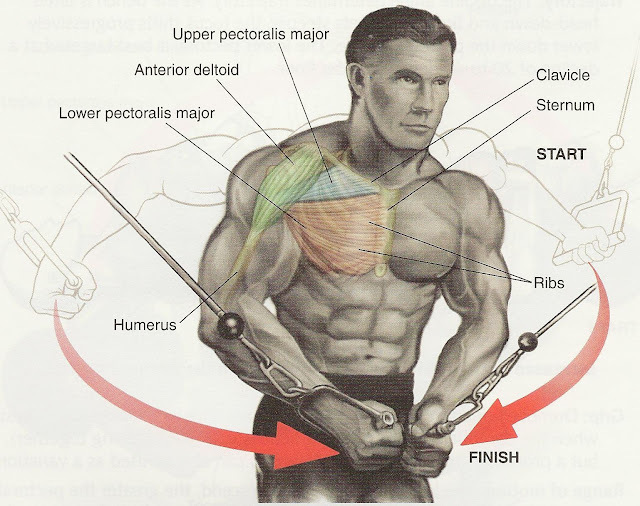 Following are the most basic and best pectoral exercises for a chest workout. The bench press is one of the most popular gym exercises for chest workouts. It directly targets the chest, and also works the triceps and deltoids, for a complete upper body workout. The bench press requires an exerciser to lie with his or her back on a bench, and lift a bar up and down, so that it lowers, with elbows bent, to the chest, and then is pushed up as the arms are extended, vertically. The bar is loaded with weight on each end. There are many different variations of the bench press, but for all, gym goers are recommended to lift a safe amount of weight; having someone to "spot," or look after the one doing exercises also allows for more safety, and an easier time lifting more weight. Bench presses may also be performed on machines (such as chest press machines) which allow the exercise, or with free weights, where exercisers maintain the same positions and motions that they would when lifting a bar. Flyes are exercises that require the use of free weights. The chest fly, which targets the pectorals, but also works the upper arm biceps and triceps is a very easy exercise to perform. To do it, one must lie with the back on a bench, with arms straight out to the sides (horizontally), and hands holding free weights. Then, the exerciser brings his or her arms up to a vertical position, so that hands, clasping weights, are beside each other. Then, arms are lowered down until they are completely open, and the process is repeated. This may also be performed on the popular chest fly machine. The cable crossover machine is an excellent tool for those seeking a great chest workout. It has two cables coming from opposite sides, and the exerciser may select the amount of weight, hold each handle at the end of each cable, with arms out to the sides, and then bring the arms in to meet in front of the body, pulling the attached weight with the motion. This is almost instantly felt in the chest, and it also works the arms and shoulders. There are many other at-home chest exercises that work the pectorals. Push ups, dips, pull ups, and others all strengthen the upper body and chest. Though some of the workout exercises listed above are physically hard, pain is a good thing, and it indicates success, and continuing successful workouts will certainly lead to desirable results.